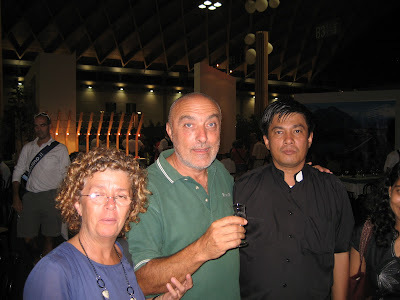 Here's a photo of Carlo and his wife Meg, along with Fr John of Burma. I'm not sure if her name really is Meg, or whether this is a concession to my atrocious Italian pronunciation. There seems to be very little that Carlo cannot do here in Rimini. Every big meeting, we get front row seats by some mysterious process. Lifts and food materialise without apparent effort. Carlo, he da Man! Capische?